Lucite with nylon thread, 24" x 24"
Born 1890 Briansk; died 1978 Connecticut. With the expectation of becoming a physician, Naum Gabo was sent in 1910 to Munich, where he studied physics and engineering; he also attended art historian Heinrich Wölfflin's famous lectures. 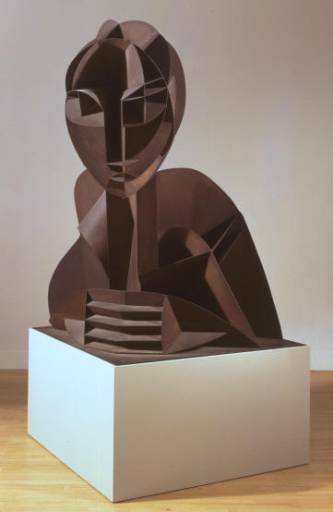 This course of study, which merged art and science, had a tremendous impact on the aesthetic that Gabo began to develop in the 1910s and which would become, after World War I, the basis for Constructivist sculpture. His training in physics included making three-dimensional models illustrating exact measurements of mathematical formulae. This experience prompted Gabo to evolve a new method of measuring space in sculpture, in which the traditional reliance on mass and volume was rejected in favor of an exploration of structural forms that would leave the surface open and the interior visible. The original "Constructed Head No. 2" of 1916 dates from the period of Gabo's first tangible expression of his theories. He and his brother Alexei spent the war years in Norway, where Gabo began making representational constructions of heads and torsos, at first experimenting in cardboard, then in wood, and finally in metal. 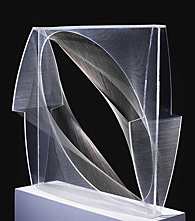 In this radical approach, Gabo neither carved nor cast, but constructed volumes through an open cellular structure of intersecting planes as opposed to closed, solid masses. The original version of "Constructed Head No. 2" consisted of galvanized sheet-iron plates covered with yellow ochre paint. It was exhibited in Moscow in 1917 and in Berlin and Holland in 1922-23. After the latter exhibition it was mistakenly returned to the Soviet Union while Gabo remained in Berlin. Gabo did not see the work again until the 1950s, when it was sent to him in pieces. Gabo stripped the paint, reassembled the work, and subsequently made six replicas in varying sizes and mediums. Gabo came into contact with his contemporaries -- Tatlin, Malevich, and Rodchenko -- when he returned to Russia in 1917. The "Realist Manifesto" of 1920, authored by Gabo but cosigned by his brother Antoine Pevsner, was compiled and published in connection with an outdoor exhibition of abstract, geometric constructions -- Gabo's first show in Moscow. The work, which represents the crystallization of his aesthetics, sets forth principles for non-objectivity in the plastic arts. The word "realist" was used because Gabo proposed an art that was based on the realities of time and space, on the universal properties of planes, edges, penetrations, depth, and kinetic rhythms.